From all corners of Greater Lakes State, hundreds of girls have come to complete the first stage of the Secondary School intake process. It is a windy Saturday morning in February and the Loreto gates are flooded with young hopefuls. During 2019’s intake, we had 424 applicants, registering a 22% increase from last year. This is the largest group since the school started and a great milestone for the Loreto Rumbek mission. 91 girls were placed in the Senior 1 classes. 17 students were placed in the Transition year – a year designed to support students with building foundations which are necessary to succeed in our rigorous educational program. The Loreto Secondary School program provides comprehensive support to the girls this means 3 daily meals, health care, uniforms, study and learning materials, 24/7 power and water, accommodation, protection and advocacy, psychosocial support and social development activities, and spiritual development. 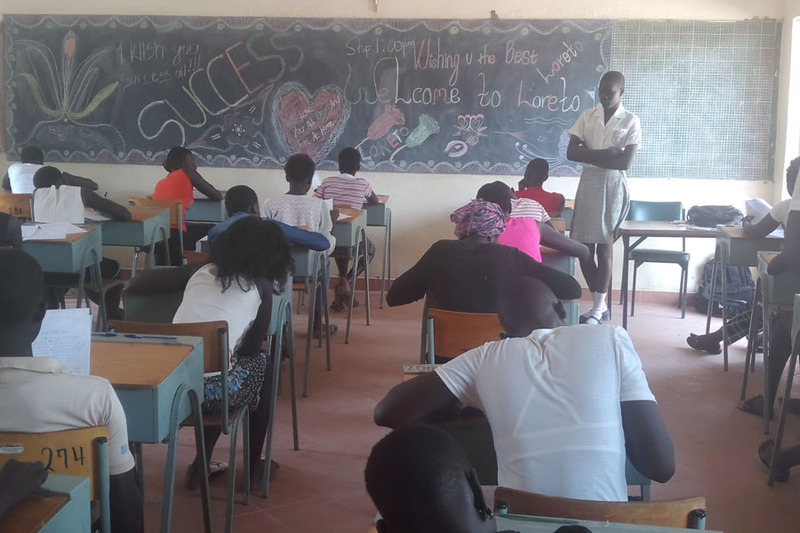 These supports work to ensure that each girl can maximize the learning opportunities offered by the Loreto Girls Secondary School and we can only continue to support them with help from you! In their excitement to become Loreto girls, many have endured tiresome journeys. 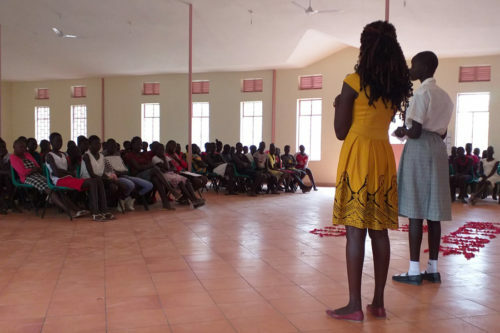 Mary Ayuen comes from Cuiebet, 45km away, and she explains, “I came two days ago and stayed with my friend in Rumbek because I didn’t want to miss the interview. I want to be a doctor.” Mary is hopeful that her dreams to study at Loreto and to secure a bright future will come true. To give equal opportunities and encourage unity and coexistence in our school, we select students from different areas. 50% are selected from Rumbek – 15% of these are from Loreto Primary School. 29% come from the Dioceses of Wau, Malakal, Torit, Yambio, Juba and Yei. 6% of students admitted are girls with disabilities, or those who have been orphaned. And 15% are returnees from East Africa. As they integrate into life at Loreto, these new students are encouraged to exhibit tolerance and respect for each other – building unity and peace. Successful students from the first stage are then invited for an oral English interview (Stage 2) to assess their motivation and suitability for Loreto and boarding life. They also undergo a medical examination administered by nurses at the Loreto Primary Healthcare Unit (LPHCU). Those successful in Stage 2 attend a school meeting where their families commit to allowing them to complete their secondary education. Each male guardian signs a commitment form pledging to support each girl throughout the four-year program. 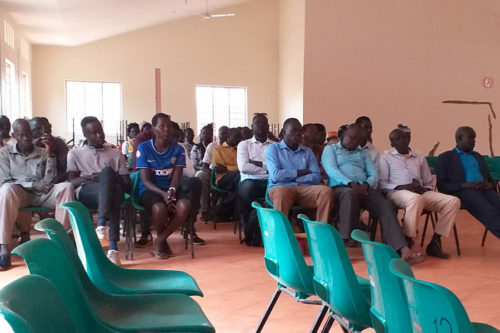 During the meeting with parents and new students, our Paramount Chief urged parents to give girls the right to study and to bring about change in their families. Students were also acquainted with the school’s code of conduct, health issues and support offered by LPHCU, boarding issues and academic policies by various heads of department. Our head teacher, Mr. Yuga also thanked the parents for their support and the girls for making it through the difficult intake process. He also encouraged the parents, “Donors heavily invest in these students and parents’ contribution to keep the girls in school is vital. We urge parents to check report cards for results and health records and newsletter to see schools updates. We are very proud of our new students and we wish them every success in their studies and development”.